This Anti-Bullying Week, join our #ChooseRespect community and kick off a campaign towards respect and positive relationships. Anti-Bullying Week is a great starting point, but this work is so important it deserves to be discussed throughout the entire year. That’s why this year we’ve designed a campaign that will help you keep up the momentum of your great work by building on conversations and progressing ideas. 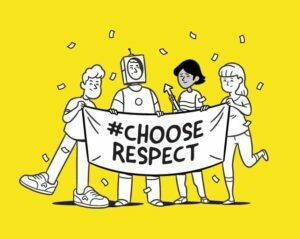 Soon we’ll be asking you to take the pledge to join our #ChooseRespect community which will provide you with reminders, news and access to education and learning resources for both primary and secondary aged groups. We will be back in touch next month with more information, but in the meantime sign up to our newsletter or follow @_respectme_ on Twitter to stay up to date.